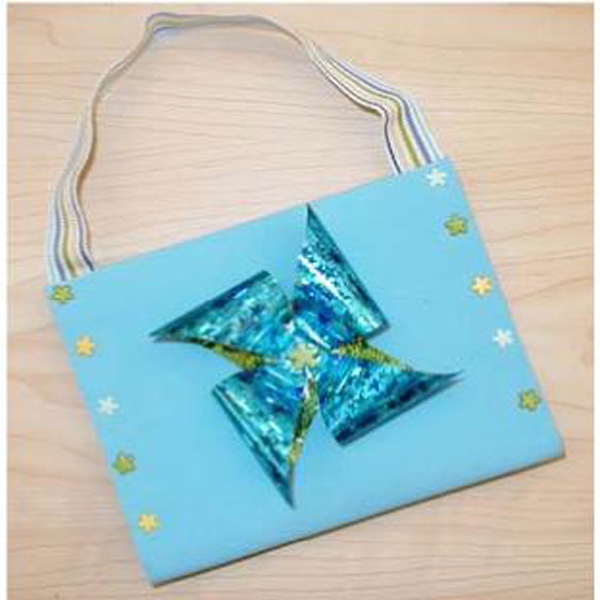 Project Description: For a fun project to do with kids, learn how to make a craft foam purse with a Grafix Funky Film flower. Fold Craft Foam in half. Punch 4 holes along both sides of the purse using your needle and thread brads through the holes and secure. Place ends of ribbon along the inside top edge of the bag and punch a hole through the foam and ribbon, secure with brads. Cut 2 pieces of Funky Film to 4”x4”. Peel of the backing and lay the films together sticky sides facing. Punch a hole in the center and then cut from the corners to the center stopping short of the hole you punched. Punch a hole in the right corners of your square. Pull the hole punched corners one at a time to the center. Secure with the large brad. Trim the edges of your flower to the desired shape. Punch a hole in the center of the purse front and carefully attach with the flower brad to the bag.